(Phys.org)—A pair of researchers, one with the University of Toronto, the other with the University of California, has found that at least one line on New York city's metro system conforms to random matrix theory. In their paper published in Physical Review E, Aukosh Jagannath and Thomas Trogdon describe their study, which included using statistical theory to analyze the arrival rates of subway cars. Back in 2000, a study was conducted of bus arrivals and departures in Cuernavaca, Mexico—among other things, the researchers found that despite unpredictable traffic patterns and driver owned buses, the buses in the city ran on a predictable schedule that conformed to random matrix theory (the researchers chalked it up to the way the drivers competed for fares). In this new effort, the researchers wondered if the same might be true for the New York subway system. To learn more about the timing of subway cars, the researchers picked two random routes to study. One was the 1 line, which runs north and serves the West Side of Manhattan; the other was the 6 line, which runs south and serves the East Side of Manhattan. The pair used information from the real-time data feed supplied by the subway system to track arrival times for the two lines. The researchers found that the 6 line ran almost randomly and therefore no predictable distribution pattern could be used to describe it. The 1 line, on the other hand, was found to follow a Poisson distribution (for all but the last 10 stations), which made it much easier for passengers to predict when the next train would arrive. The researchers suggest the difference between the lines is due to the amount of traffic on each. 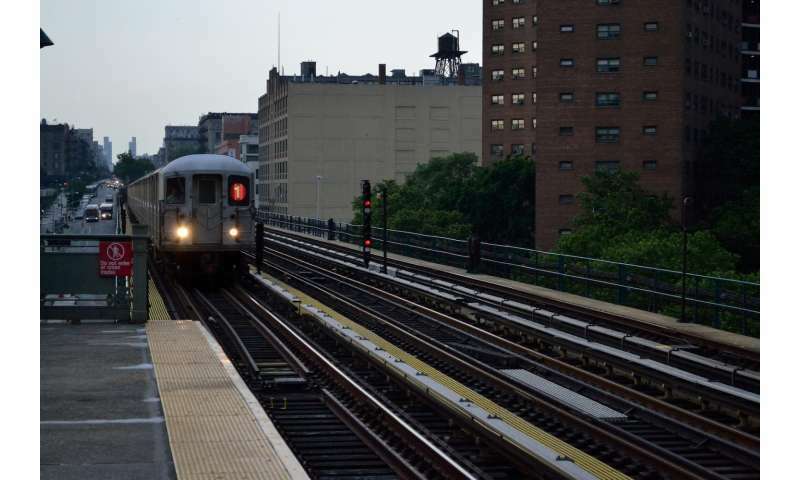 The 6 line is heavily used, and because of that, suffers frequent delays, such as passengers preventing doors from closing in an expedient manner. The 1 line, on the other hand, has fewer passengers, making it much easier for trains to run on time. The researchers suggest their results might be used by city planners to optimize the system for efficiency. We analyze subway arrival times in the New York City subway system. We find regimes where the gaps between trains are well modeled by (unitarily invariant) random matrix statistics and Poisson statistics. The departure from random matrix statistics is captured by the value of the Coulomb potential along the subway route. This departure becomes more pronounced as trains make more stops.